Materials used: Saikoho goat hair, aluminum ferrule, hard maple wood handle. Apply foundation on face with clean fingertips and use buffing motions with brush to blend. I have a slight obsession with foundation brushes (and foundations) so anything slightly different and luxe, I will want to try it. I typically use the GSN5 for foundations and even though I do prefer long handles, I needed something that would fit into my brush travel roll. This brush is so amazingly soft, it feels like the softest squirrel hair but distributes liquids way better. It's quite small in diameter but I kind of like that since when I travel I try to bring less than 10 brushes (haha) so I can't afford to have a large one PLUS a small one for blending out under eye areas. This one works perfectly. I actually started using it as part of my regular routine and will probably need to buy another for travel! Wow small brush with fierce. This is not as soft as my gsn line. It is more dense. I do like it for buffing foundations because it does not irritate my skin. People with sensitivity and acne should welcome themselves to japanese brushes. Synthetic can be harsh sometimes. This small brush is good if you like to work sections by sections. I have tons of brushes and chikuhodo never disappointed me. Its just so expensive... but with proper care like caring for your hair it will last a lifetime. This brushed started shedding immediately after I washed it. It's gotten to the point where I no longer us it because I got tired of picking off the individual hairs on my face after use. It also left streaks in my makeup, which was really disappointing at the price point. I loved that this brush was small enough to fit in my makeup brush holder that I carry with me everyday. Seems, to be the only positive thing about this brush. While the brush is well made and beautiful, I found that I had to use nearly triple the amount of foundation I usually use for my face. The brush is so dense it soaks up the foundation. I had to return it. The takumi T3 is a beautiful brush. I am a fan of Fude and have a fair few from Hakuhodo. The T3 was my first try of any of the Chikuhodo brushes(purchased through beautylish, thank you for your wonderful service) . I was looking for a brush for liquid or cream foundation with the same softness and quality that Fude have for powder products. The quality is immaculate, no shedding, ultra fine softness of the saikoho bristles very gentle and lovely on skin, even for sensitive skin. 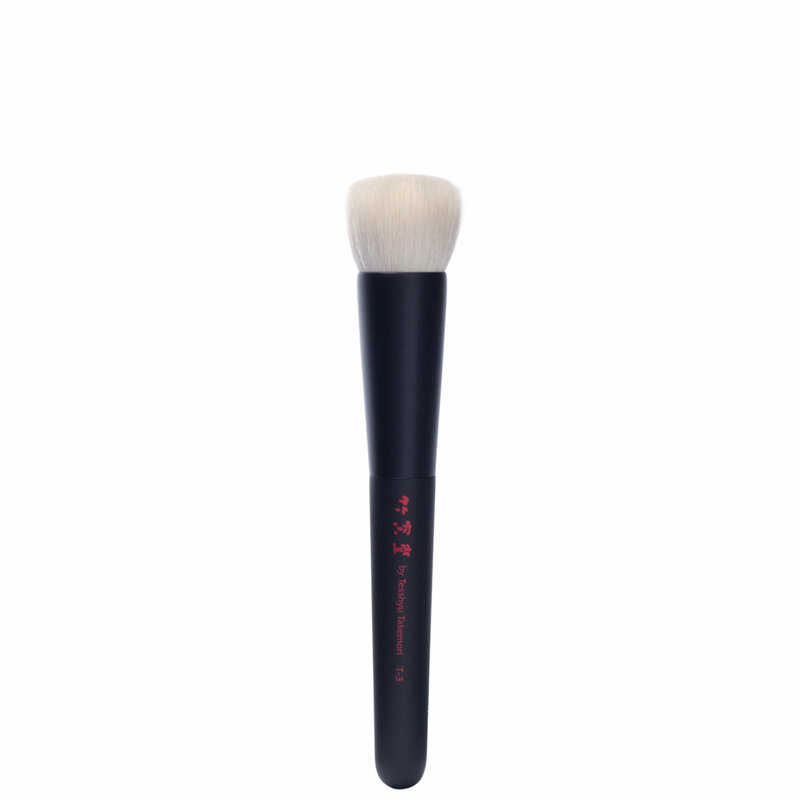 It's a brush you can really enjoy stippling and buffing your foundation into a beautiful natural finish on your skin. I used this with chantecaille future skin foundation and the finish was beautiful. The process is thoroughly enjoyable. Though smaller than the Rae Morris 21 and Hakuhodo G5557, the density and structure is really nice to handle and the finishing texture is flawless. I bought this with the T4 cheek brush which is equally stunning. It's just reinforced my devotion to Japanese Fude and will be building my chikuhodo collection along with my Hakuhodo brushes.